My name is Evangelos. I am a professional with 24 years experience in Palaeontology. I live in Peterborough, Cambridgeshire, England but have also travelled widely. 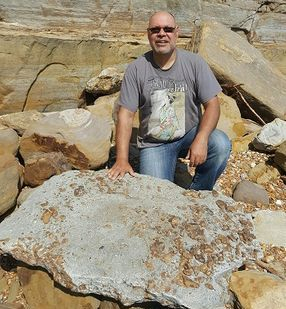 I have discovered several new fossils and I am still researching some of them. My most recent discoveries are that of 4 new chimaera (close relatives of sharks) species found in the Peterborough area which are of Callovian, Jurassic age. This was announced at the PalAss conference held in Dublin during December 2012. A scientific paper will be available soon. I have also written and published 3 small books on fossils. I attended the Jack Hunt Comprehensive School, Peterborough between 1975-1982 and I graduated from the University of Hull in 1985. 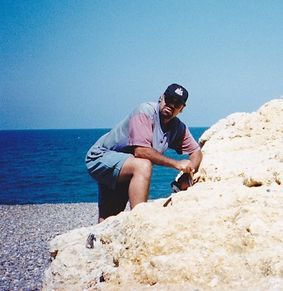 The picture on the left is that of me hunting for Cretaceous sea urchins at Weybourne, Norfolk in 1998. All fossils sold on this website have either come from private collections or have been commercially/legitimately collected with permission from land owners. I have donated many of my fossil finds to several museums, most notably and recently to the NHM in London. Please check out my Customer Feedback page. Here you will see the actual comments from a selection of satisfied customers. The picture on the left was taken at Lyme Regis, Dorset in 1996. My discovery of a crinoid sudden death event in 2002. Hundreds of stem sections uncovered on the beach platform just west of Seatown, Dorset. The very same Pentacrinities fossilis on sale here. They were all in a band just a few inches thick but running about 50 yards along the beach. Stick around... I'll be back ! 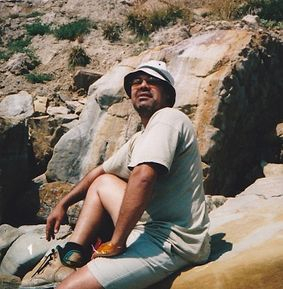 I started my fossil business on the 1st March 2004 and have been a verified Paypal business user since. All my transactions are guarenteed to satisfy or full refund on safe return. 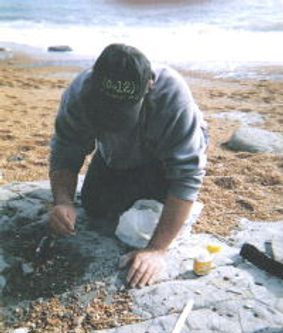 This is me hunting for Cretaceous shark teeth at Rock-A-Nore, Hastings, Sussex in 2004. Beautiful Place But Dangerous ! 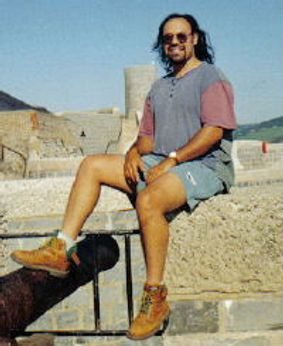 This is me waiting for low tide at Garden Cliff, Westbury-on-Severn, Gloucestershire in 2006. Found some very nice Triassic vertebrates on this field trip. 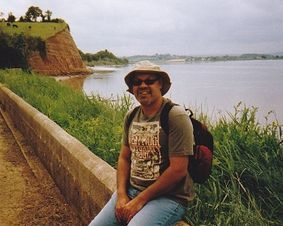 This picture is of me hunting for Triassic vertebrates at Blue Anchor, Somerset in 2008. I hope you enjoy my fossil website and visit again soon. 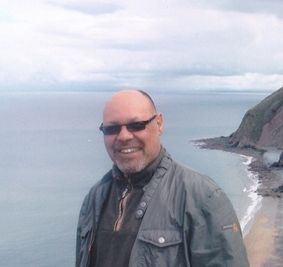 This picture of me was taken on the north Devon coast in July 2010. 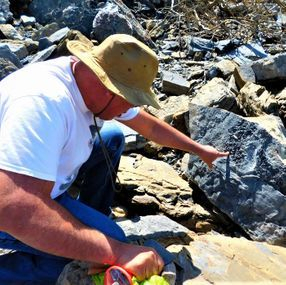 Not many fossils found this field trip but t'was a lot of fun nonetheless. Watch out for the mud banks here ! 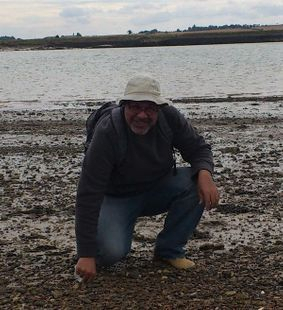 The picture on the left is that of me hunting for Eocene age shark teeth and Pleistocene mammal/bird fossils at Burnham-on-Crouch, Essex in August 2012. 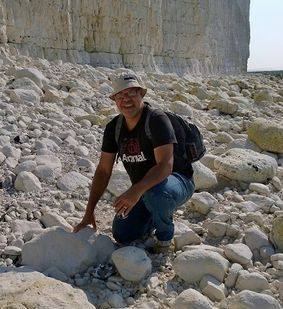 The picture on the left is that of me hunting for Cretaceous age shark teeth and sea urchin fossils at Beachy Head, East Sussex in September 2014. The picture on the left is that of me examining Cretaceous fossils on the East Sussex coast in August 2016. 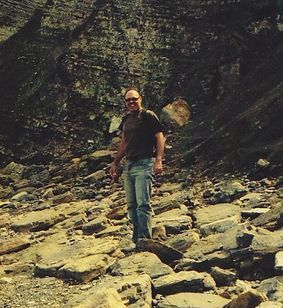 This picture is of me hunting for Triassic vertebrates at Aust Cliff, South Gloucestershire in 2018. I hope you enjoy my fossil website and visit again soon.